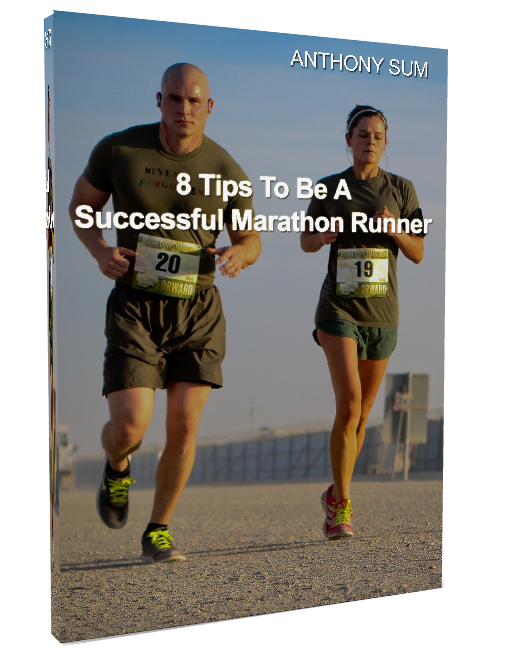 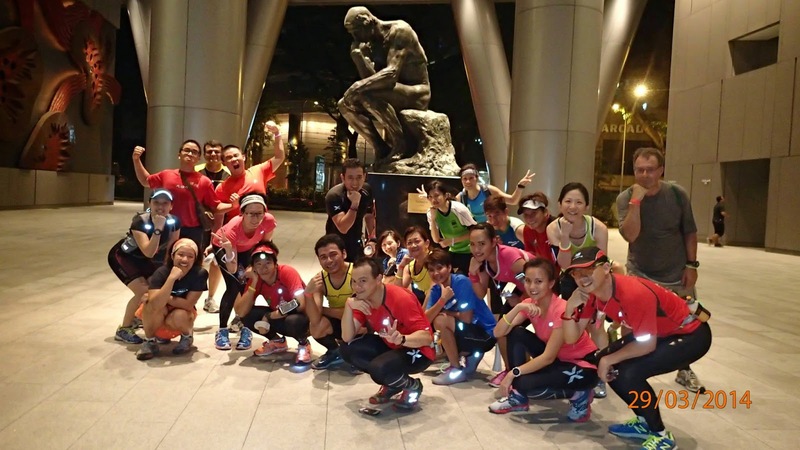 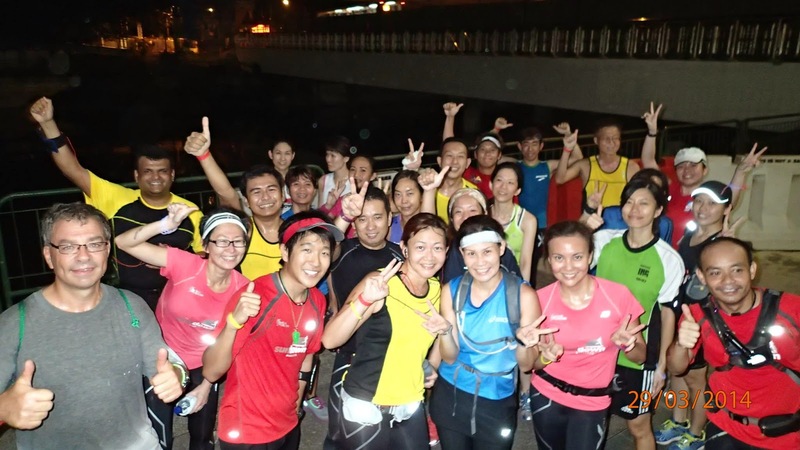 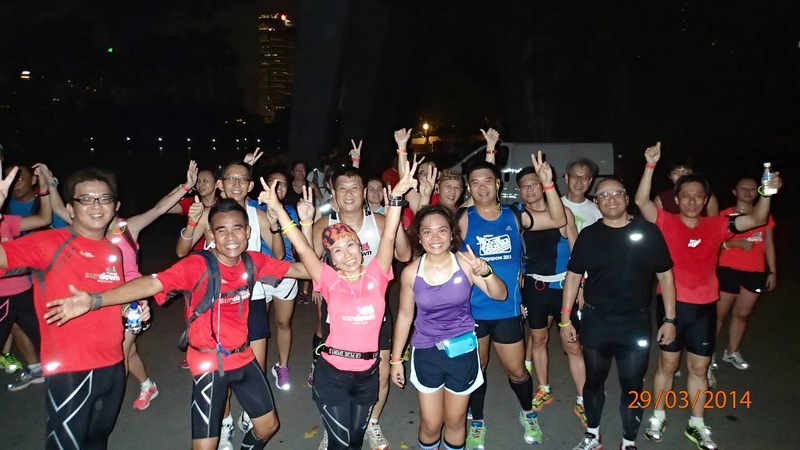 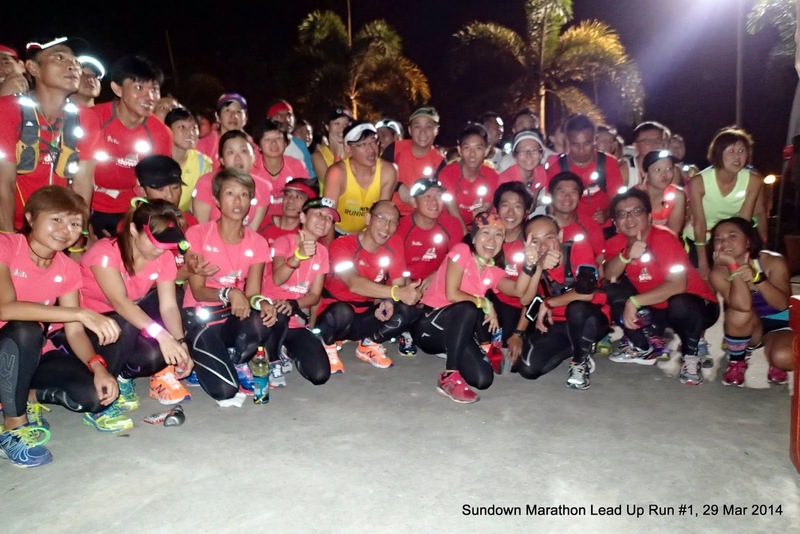 The Sundown Marathon Training (Lead Up) Runs series is an integral part of the Sundown Marathon program to help Sundown Runners build up for a good race on May 31. 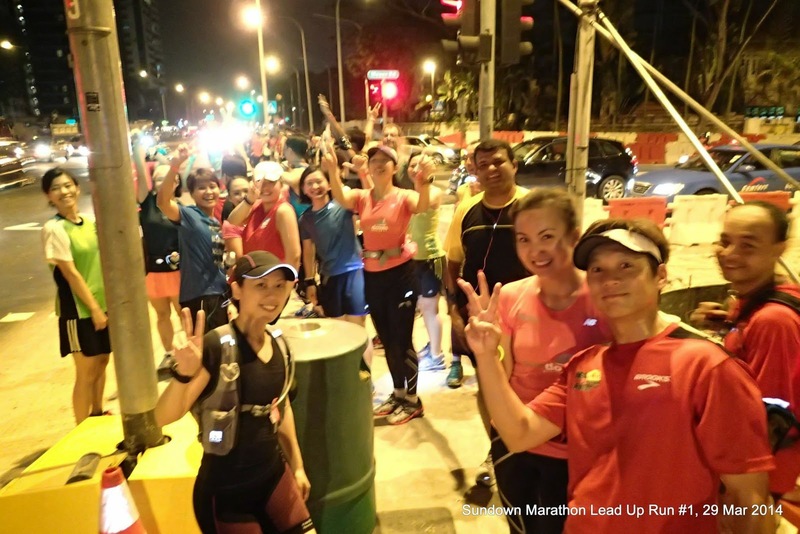 Two weeks before Lead Run Run #1 on Mar29, registrations already busted the maximum allowable being closed…and that happened to Lead Up Runs #2 and #3 as well – registrations for all 3 Lead Ups maxed out even before we got underway with Lead Up Run #1. 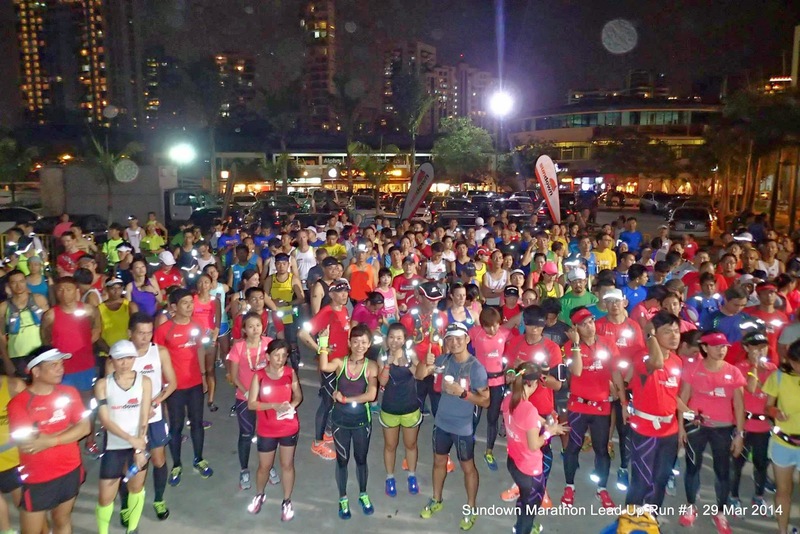 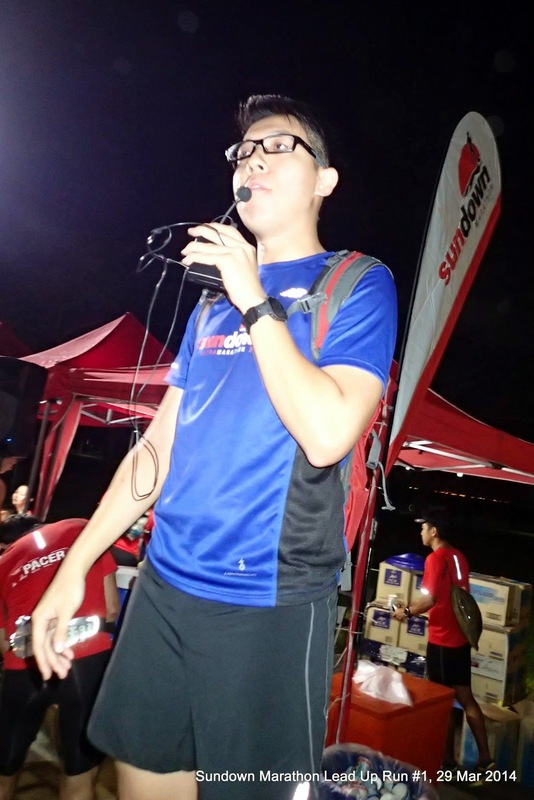 In anticipation of a large crowd, the Sundown Organizer (HiVelocity) together with the Sundown Pacers worked closely with the hydration sponsors 100Plus & Maxinutrition to put together what turned out to be an eventful and exciting night for the 400+ Sundown Runners who came. 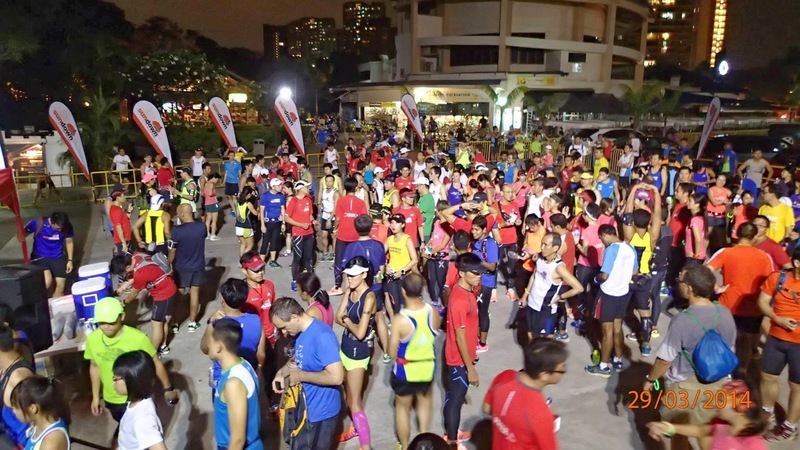 The first ones started to drift in from 7pm, and by 8pm, the Playground @ Big Splash, ECP was buzzing with the heat of excitement. 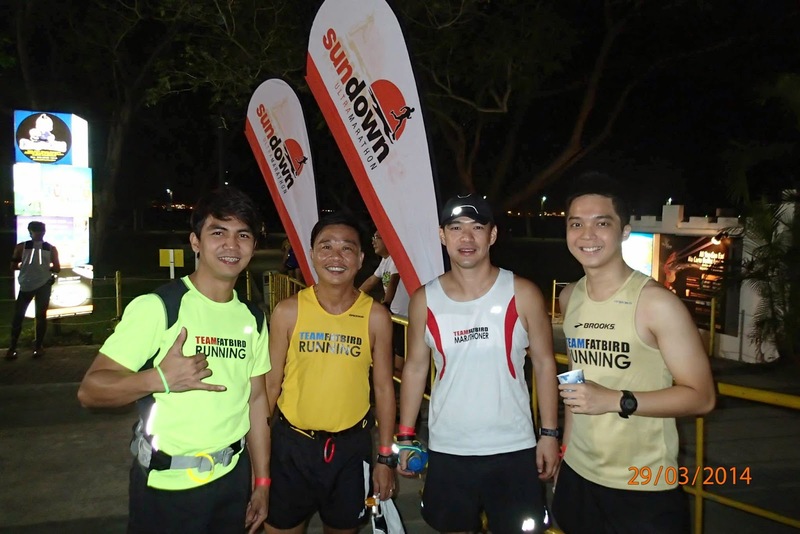 The Sundown Pacers were on hand to welcome the runners into their respective pace groupings of Half Marathon (2:00h, 2:15h, 2:30h) & Full Marathon (4:00h, 4:30h, 5:00h, 5:30h, 6:00h), stamped them with the Sundown Marathon chop, and assimilated them into the team. 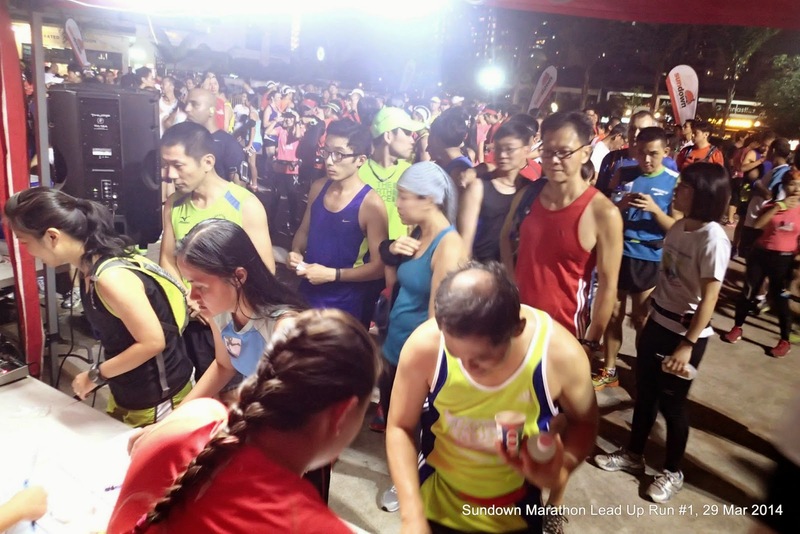 A warm welcome from HiVelocity was given before Team FatBird briefed the runners on the evening’s routes, training paces, safety instructions, and introducing the Sundown Marathon Pacers to the public for the very first time. 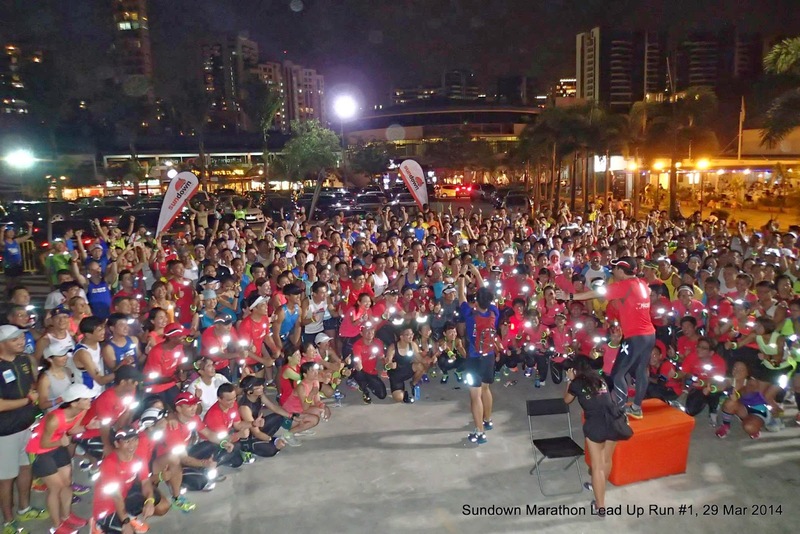 The respective Pace Groups were then flagged off to the sound of the blaring horn, and with the lighted wrist bands provided and the blinking lights on their bodies, the Sundown Runners & Pacers strode down ECP towards Fort Road, looking like a flock of lighted, blinking birds – a sight to behold. 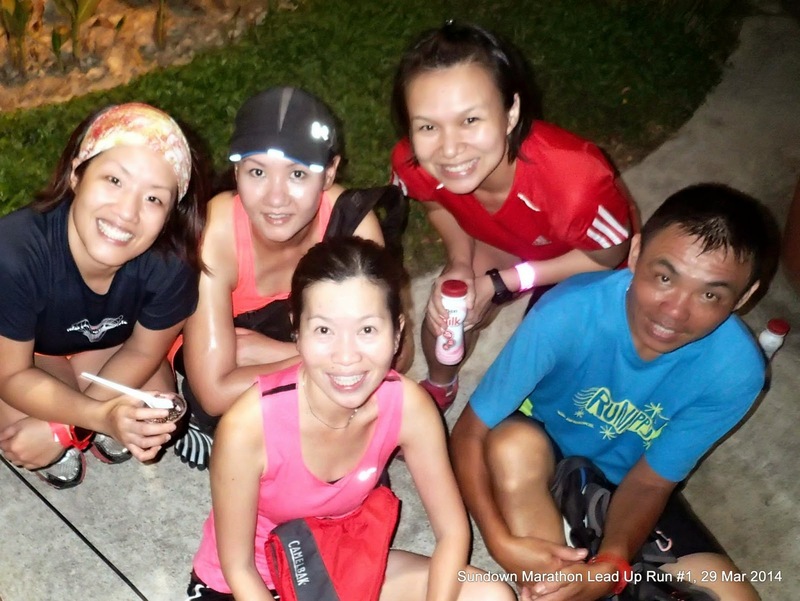 The night flight then went along Mountbatten road before turning into the serene Geylang & Tanjong Rhu Park Connectors. 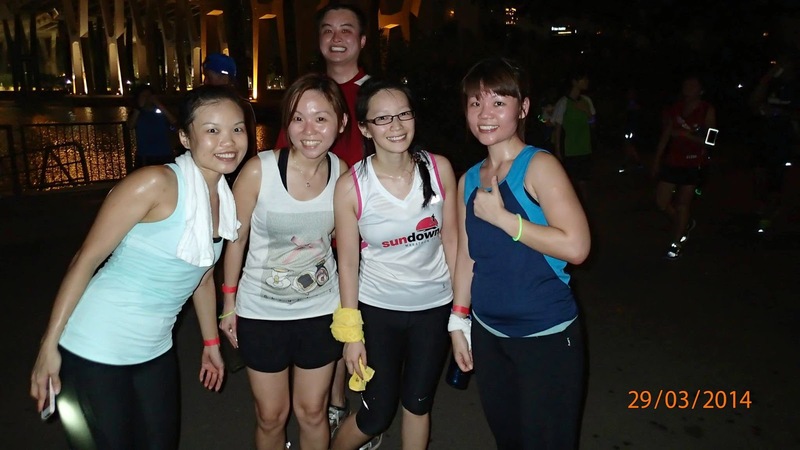 The run along the quiet riverside on the ride with greenery on the left, interspersed by occupied park benches made for quite a relaxing and therapeutic run, and the occasional light breeze in what was a humid evening helped stoke the already high spirits of the runners – song and laughter broke out midway as the runners approached the Viper water point at the entrance to Gardens By The Bay – East. 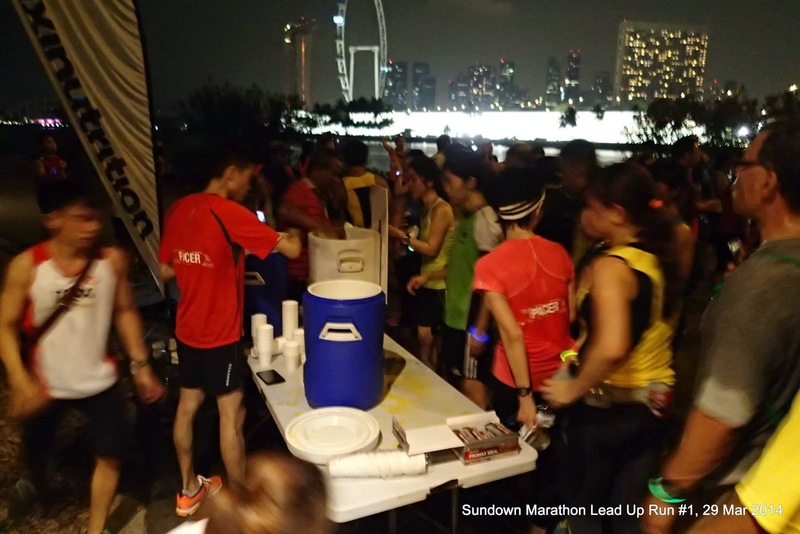 The Maxinutrition drinks station, stocked with iced cold Viper isotonic & electrolyte drinks was a welcomed sight for the thirsty flock as they shouted with joys of “Sundown, Sundown, Bring On The Night!”. 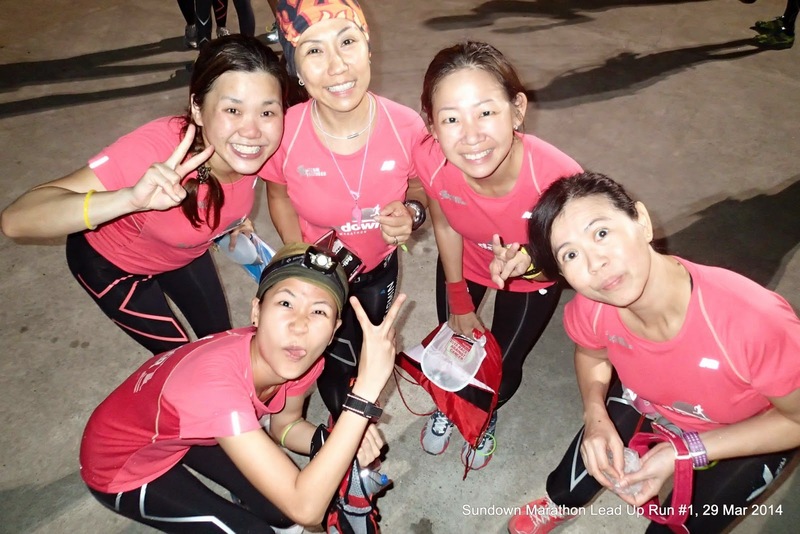 After a regroup, the runners continued across the Marina Barrage, and when they saw a crowd gathered, joyful choruses of “Ehh-Oh Sundown Runners Ahh…I Wanna Be A Sundown Runner Ahh…HOOhh-HAHhh” broke out to applause and appreciation from the public, who were amused and impressed by these groups of runners maintaining steady paces and yet looking and feeling so happy and relaxed. 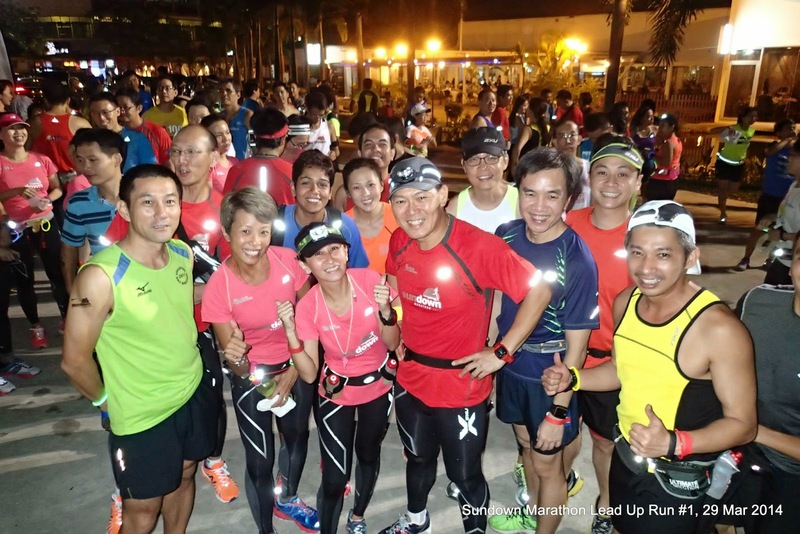 The Half Marathon groups took their cues from their Sundown Pacers and turned back for their return back to Big Splash for a 17km BaseBuild pace run completion. 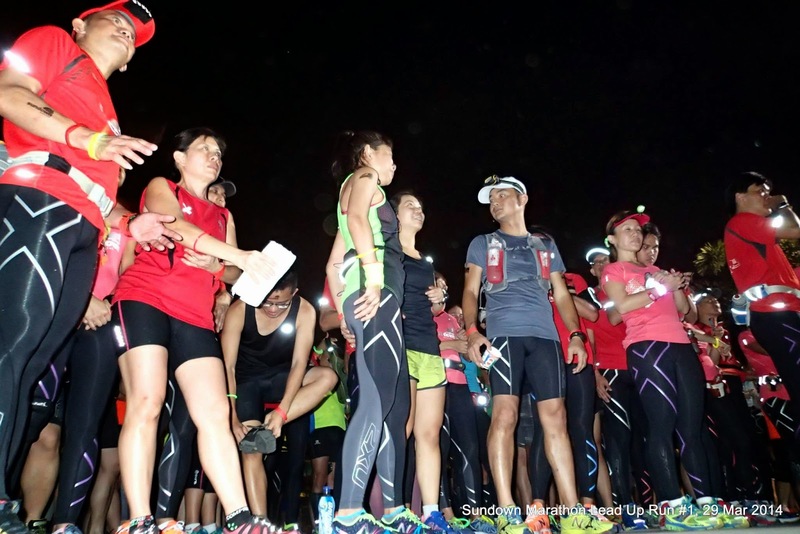 The Full Marathoners proceeded towards Marina Bay Sands, which was choc-a-block with many people and activities around the bay. 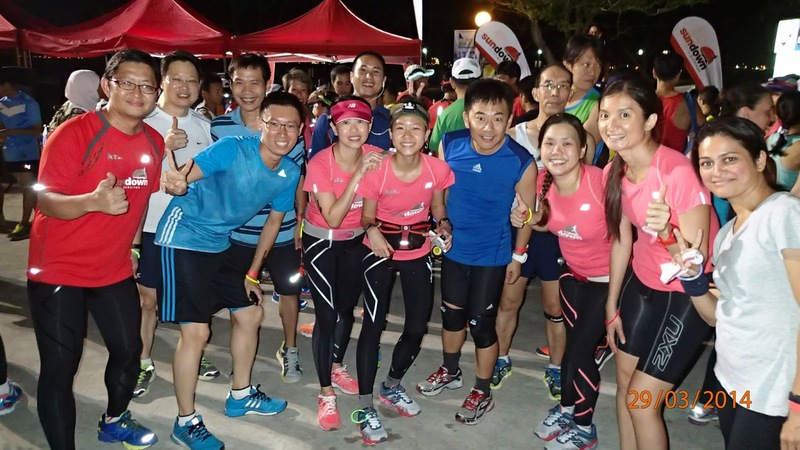 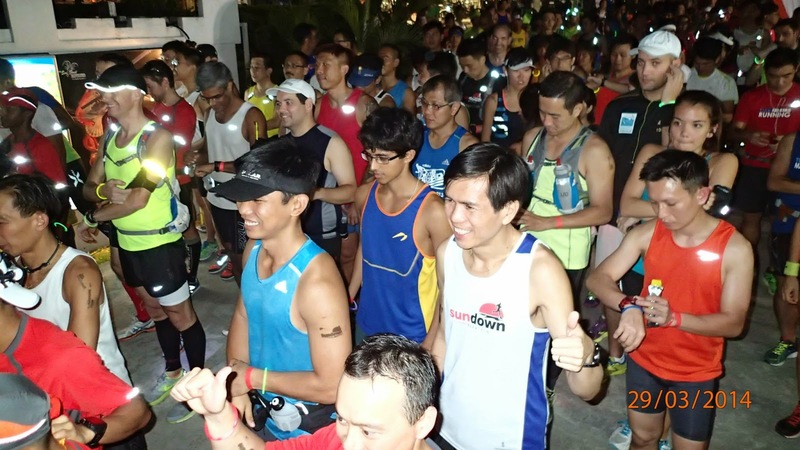 The Sundown Runners broke into song a few more times as they cleared the way for a relatively smooth passage to Fullerton Bay Hotel before making their U-turn back to Big Splash. 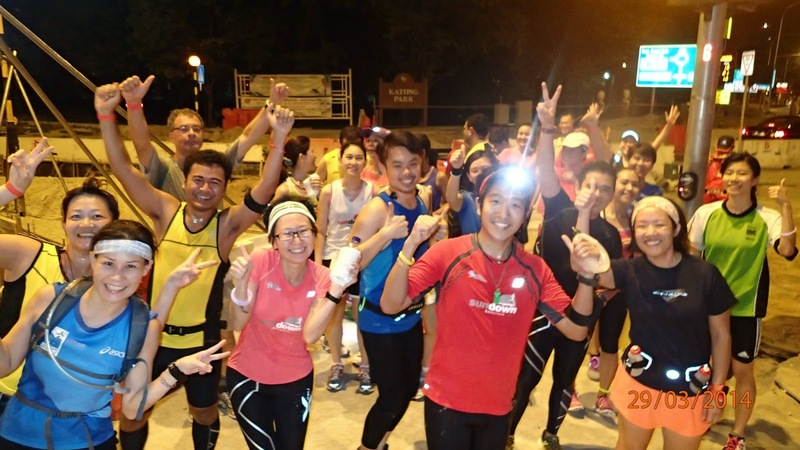 The Lead Up Runners were having so much fun as a group that they did not feel too bad in spite of the clock closing in on their ‘sleepy’ bodies and having to contend with humidity. 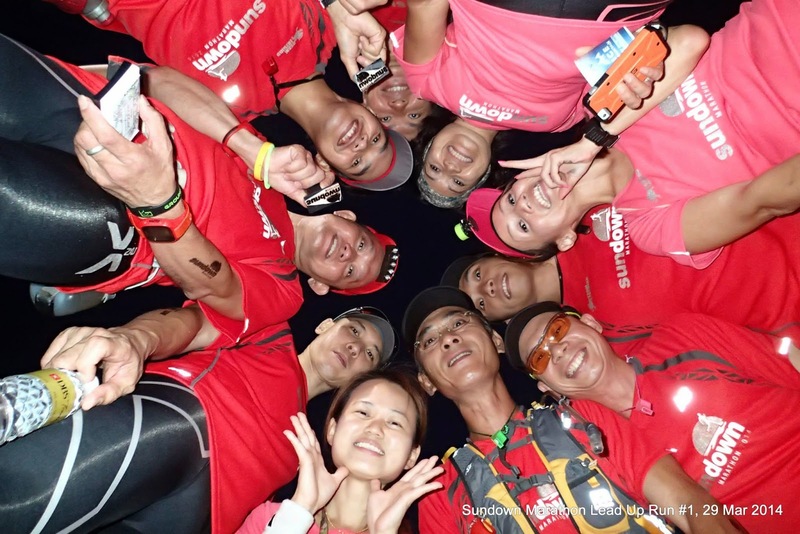 The group energies and the motivation by the Sundown Pacers went a good way in ensuring that the groups stayed close together and in pace all the way back. 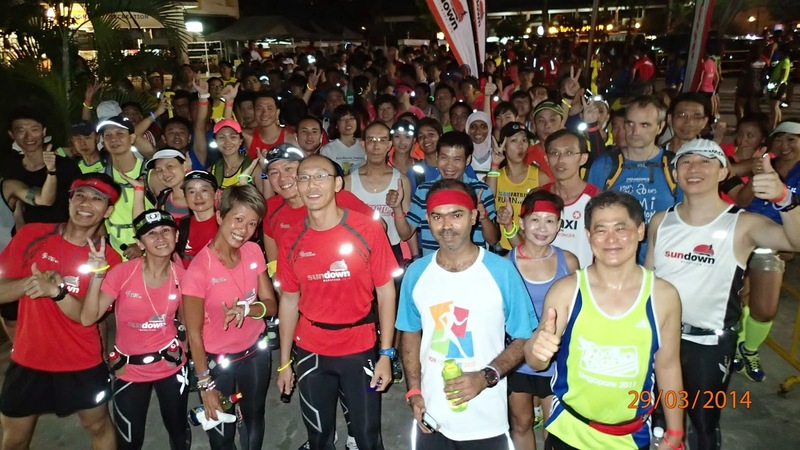 The Half Marathoners completed their joyful journey from 10.30pm onwards while the Full Marathoners reached back to Big Splash at 11pm, leaving them with ample time for another 2km-4km to complete the 26km distance prescribed. 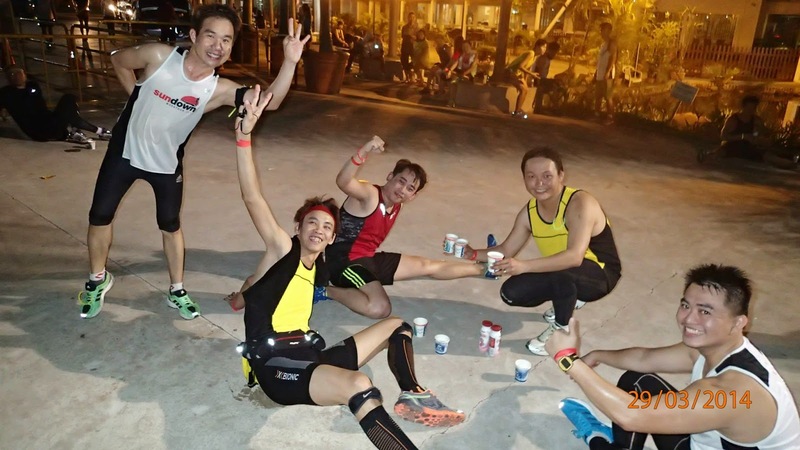 The beeline for the iced cold 100Plus was well managed by HiVelocity and the tired runners were just happy to relax on the floor, sipping their iced cold drinks and maxi milk for recovery, while listening in to the debrief and instructions for Lead Up Run #2. 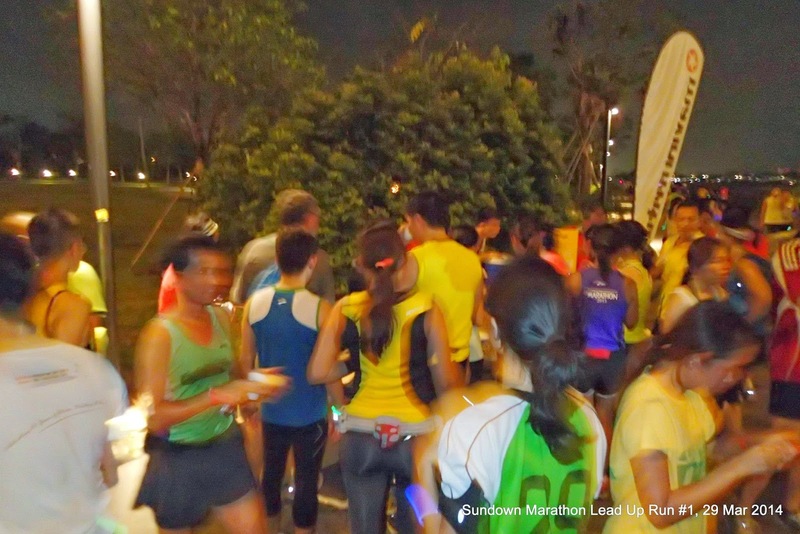 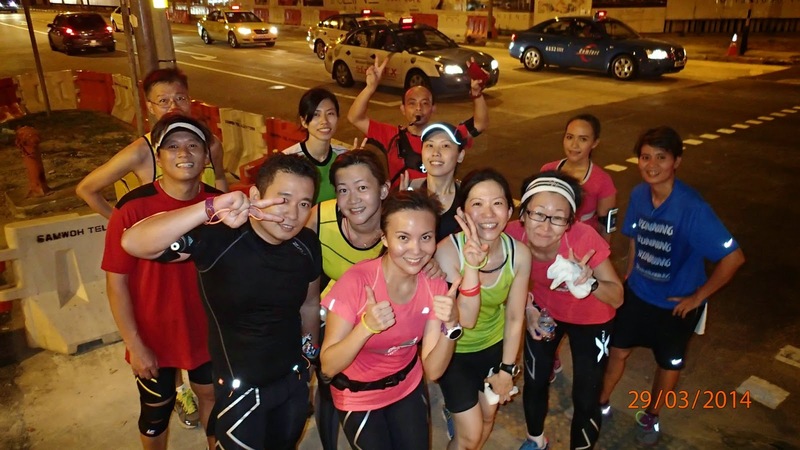 As Lead Up Run #1 came to a close at 11.30pm, the high levels of endorphins kept the runners, especially the Sundown Pacers buzzing as more group photos were taken, coupled with excited chatter and sharing of tips and information. 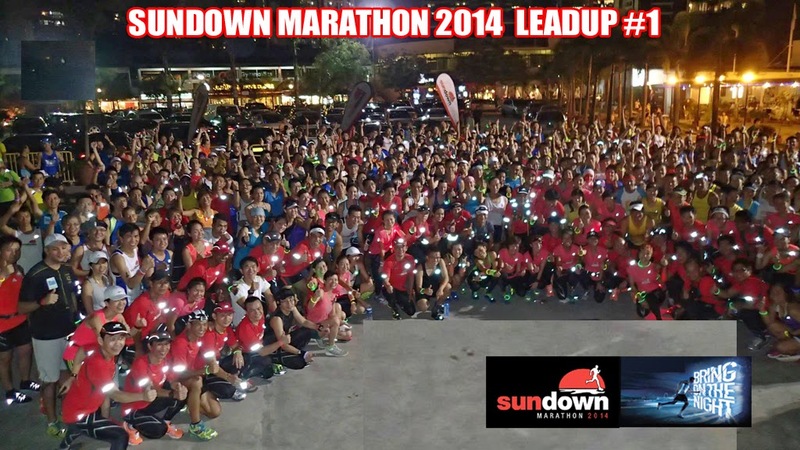 It was a very successful and immensely enjoyable lead up run, which would not have been possible without the outstanding organization of HiVelocity, the professionalism and commitment of the Sundown Pacers, as well as the enthusiastic participation and engaged cooperation of the Lead Up Runners – you all ROCKED THE NIGHT! 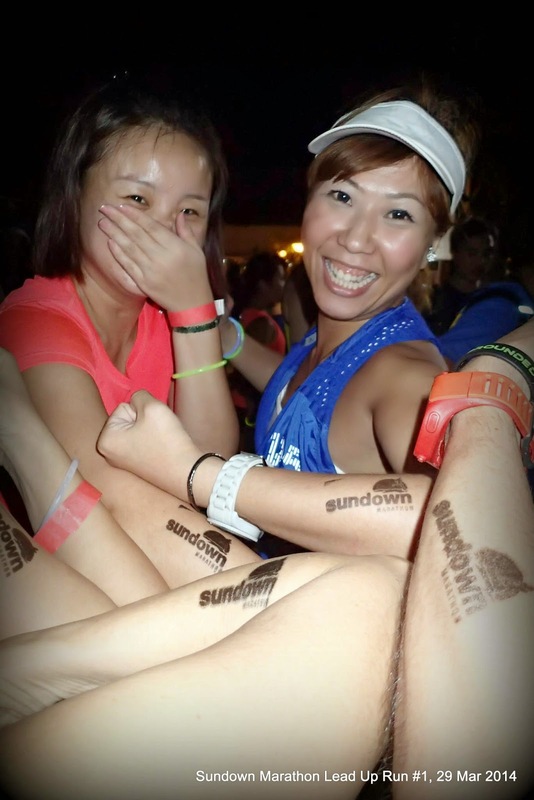 Sundown, Sundown, Who’s The Best! 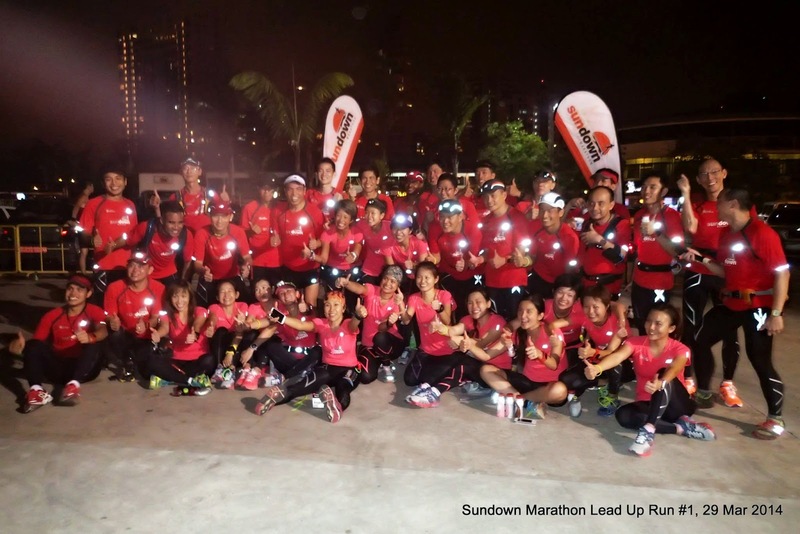 Sundown Runners, We’re The Best!